Did you use to have some sort of intuition for what “lvalue” and “rvalue” meant? Are you confused about glvalues, xvalues and prvalues, and worry that lvalues and rvalues might also have changed? This post aims to give you a basic intuition for all five of them. Why did I put “Can’t move” and “lvalue” in red in that diagram? It turns out that you might want to move from certain lvalues! For instance, if you have an lvalue you won’t be using anymore, you can std::move() it to cast it to an rvalue reference. A function can also return an rvalue reference to an object with identity. C++11 introduces a new value category “xvalue”, for lvalues which can be moved from. It might help to think of “xvalue” as “eXpiring lvalue”, since they’re probably about to end their lifetime and be moved from (for instance a function returning an rvalue reference). But we’re not quite there yet, what’s a “glvalue”, and what does “rvalue” mean these days? It turns out that we’ve already explained these concepts! We just haven’t given them proper names yet. A glvalue, or “generalized lvalue”, covers exactly the “has identity” property, ignoring movability. An rvalue covers exactly the “can move” property, ignoring identity. And that’s it! You now know all the five value categories. As usual on CppQuiz, the objective is to figure out the output of the program, according to the C++ standard. Before continuing, please try to find the answer yourself! if the static type of the object to be deleted is different from its dynamic type, the static type shall be a base class of the dynamic type of the object to be deleted and the static type shall have a virtual destructor or the behavior is undefined. So why is this undefined behavior? It would be hard for the standard to specify exactly what happens when an object is not properly destroyed. In practice, most compilers will probably go with the normal rules for virtual functions, print bdB, and simply not destroy the D part of the object. But since the behavior is undefined, there’s no guarantee for this. One could argue that even if the result of not destroying D properly is undefined, the standard could still mandate which destructor(s) actually get called. However, when undefined behavior occurs in a program, the entire execution is undefined, so there really would be no point. If you’re curious about undefined behavior, I’ve written about it before. That article also has links to some really interesting, more in-depth articles about the subject. I have already argued that you shouldn’t put all your includes in your .h files. Here is one more reason, compilation time. file5.h apparently need access to something which is defined in file4.h, which again needs access to three other headers. Because of this, all other files that include file5.h also includes file[1-4].h. In c++, #include "file.h" really means “copy the entire contents of file.h here before compiling”. 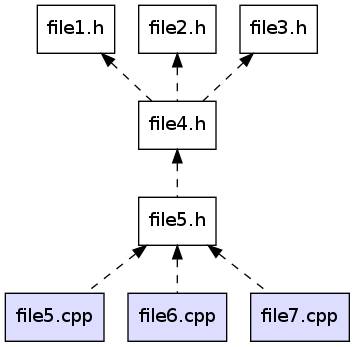 So in this example, file[1-3] is copied into file4.h, which is then copied into file5.h, which again is copied into the three cpp files. Every file takes a bit of time to compile, and now each cpp file doesn’t only need to compile its own content, but also all of the (directly and indirectly) included headers. What happens if we add some compilation times to our diagram? 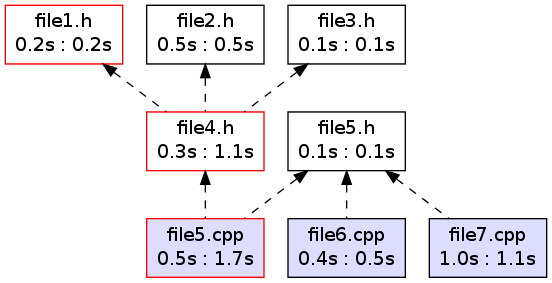 The compilation time of the file itself is on the left, the compilation time including the included headers are on the right. As we can see, this has a dramatic effect on compilation time. 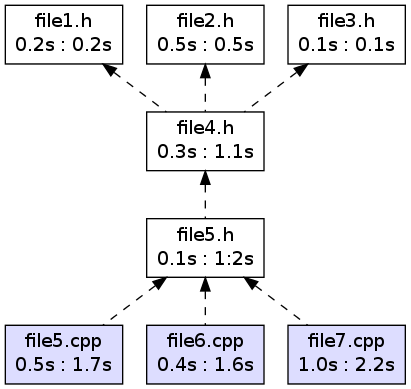 file6.cpp and file7.cpp just needed something from file5.h, but got an entire tree of headers which added 1.2 seconds to their compilation times. This might not sound much, but those numbers add up when the number of files is large. Also, if you’re trying to do TDD, every second counts. And in some cases, compilation times of individual headers can be a lot worse than in this example. The compilation time of file[6-7].cpp is significantly reduced. Recompilation time: 1.7 seconds vs. 4.5 seconds. And in a large project, this would be a lot worse. So please try to move your #includes down into the cpp files whenever you can! The Graphviz code and makefile for this blog post is available on GitHub. Together with Håkon K. Olafsen, I founded Kjeller Software Community earlier this summer. Our first meetup is due this Wednesday (September 26). I will do a demo of Google C++ Testing Framework, aka. GoogleTest, and afterwards we will have a few beers and chat about programming and all things geeky. Hopefully we will also get some good suggestions for future events and meetups. The meetup will happen at Klimt pub in Lillestrøm, at 6:00 pm. This meetup is done in cooperation with Oslo C++ Users Group, of which I am also a member. If you are into C++, and live in the greater Oslo area, that group is also highly recommended. Notes from the talk, and a blog post about Google Test will be up later this week. If you enjoyed this post, you can subscribe to my blog, or follow me on Twitter. You can also follow Kjeller Software Community on Twitter.